I saw something yesterday that stopped me. It was Sunday morning and our worship team was leading us in music. Looking to my right, I watched the section of deaf ministry as someone led them with sign language. I’ve always loved watching this. I think it’s so beautiful. But this morning I caught two of our leaders sitting, facing two of our congregation. They held their hands and signed while those hands were clasped together. I quickly realized that not only were these two deaf, but also blind or severely limited in their sight. But they were worshipping. Unable to hear the music or see the interpreter, one still swayed in time with the woman holding their hands, signing. And it captivated me. See, so many of us have our own favorite style of worship. Be it hymns or rock, acoustic or full band, bright-light show or dark venue; we all have a style that is perfect for us. (I’m speaking to myself here too, people.) And when our style isn’t the one on stage, we don’t engage in worship. We fold our hands and close our mouths, sometimes even our hearts. Oh! We are missing out! I watched these two on Sunday and was brought to tears. They didn’t hear the music. They couldn’t see the lights. They had no clue what was going on around them—but they worshipped. In their own quiet and darkened world, they entered into the beauty of God’s presence and worshipped Him in a way so many of us miss through the distraction of our own desires. 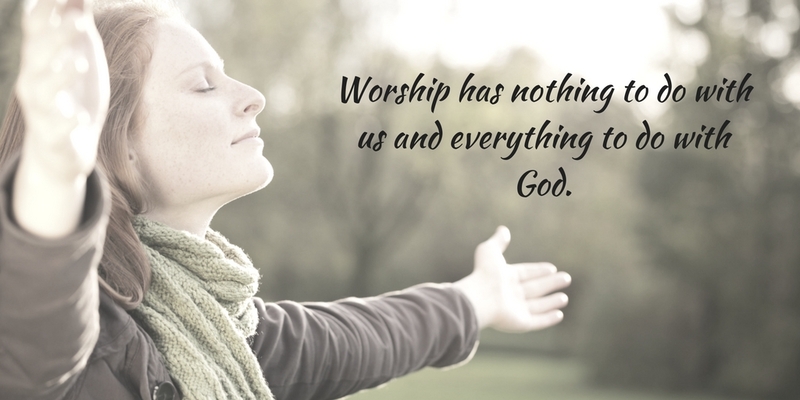 Worship has nothing to do with us and everything to do with God. It’s our offering to him. When we rely on the person on stage to create our perfect atmosphere before we can worship God then we are 100% missing the point of worship. God is God no matter the song that’s playing. He is the same God who resurrected the dead things in our lives. He is the same God who forgave our sins. He is the same God who died so we can live—and live abundantly. Worshipping God should be something we cannot contain. It goes beyond our earthly senses and focuses on our hearts. And that’s what I saw yesterday. That’s what will stay with me. The beauty in true worship. What a great reminder. Worship is less about me and all about Him!